So whenever you upgrade to VS 2008 to VS 2010 and also upgrade ASP.NET version to 4.0. And if your website hosted on IIS, when you open your VS 2010 IDE it prompt a message asking to upgrade to asp.net version to 4.0. When you say yes it upgrades the version at IIS. So let’s come back to our original problem. When I diagnosed I found the machine was having 64bit OS. 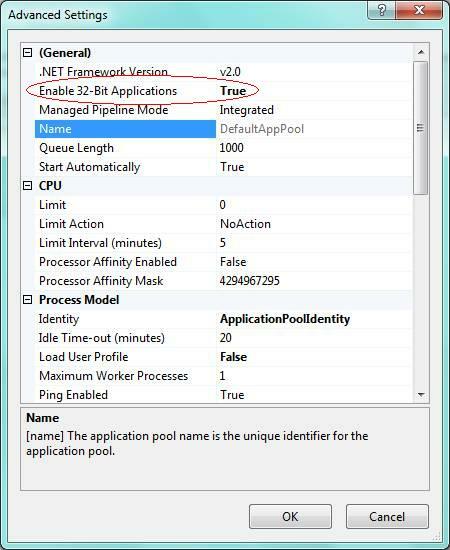 And at IIS, there is setting “Enable 32-bit Applications” at application pool level that is by default set false . So if you are having 64 bit OS and your application target 32-bit applications then this property must be true. Now you can see the Red oval that that is the name of Application pool set for this directory. 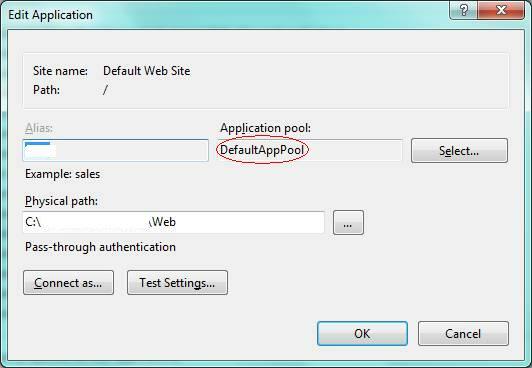 Now click on Application pool-> Click on DefaultAppPool -> and click on Advance settings. Here you can see Red oval, I have set Enable 32-bit Applications to true. Now restart the IIS. Now run your application and it must be working. Recently, when microsoft launched Visual Studio 2010, they launched it with the very nice Campaign “Life runs on code”.Who all have seen the any advertisement of VS 2010, must have seen this also. It’s very true, we, developer’s life runs on code, and our code runs on Visual Studio IDE ( Obviously only on development phase 🙂 ). As most of the time in our offices and home (only for workaholics 🙂 we spent most of the time with visual studio IDE, we always try to find some way to code faster/better, to increase the productivity. Visual studio IDE is full of myriad features, that helps us for faster and smoother coding. We most of the time are not aware of this and don’t use these.I always try to find some good feature at Visual studio, which we can use in our daily life and share with you all. As we have other window, Error/Warning window, we also have Task list window.To see this window, Go To View->Task List or directly using the keys Ctrl+W, T. This task list window show us the TODO list that we track and other annotations. 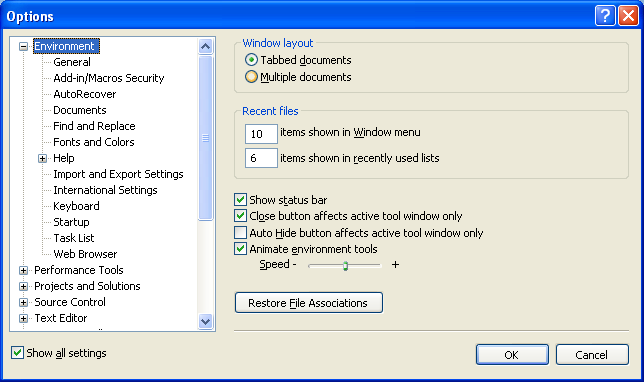 Task list window has two views : User Task Window and Comments Window. We’ll discuss first comments Window. Generally, we write some TODO or UNDONE comments, while development phase of our application. These comments are a sign, that we need to update/Change the code before releasing to QA/Staging environment. We can click on any of it and it will take us to directly that line of code. HACK, TODO, UNDONE, UnresolvedMergeConflict are default comment Tokens in VS IDE. But one can add custom tag based on their requirements.Go to Tools-> Options then under Environment click task list as below ( If Task list is not visible make sure “Show all settings” checkbox is checked at bottom of Options window). To add a Custom Token, write the Token at Name input box, set the priority and then click on add button.We can also remove/change the existing token with the given buttons. This gives you option to write the description of the task and set the priority. Once the task get completed, then one can mark it as completed by checking the checkbox. Note: I have VS2008 for this post. This might be a very small trick for all us and some of us may already know this. But who doesn’t know, they can save enough time while working with Visual Studio IDE. As we used to spend a lot of time in our office/workstation while working with IDE. Normally we are also connected with the Internet. 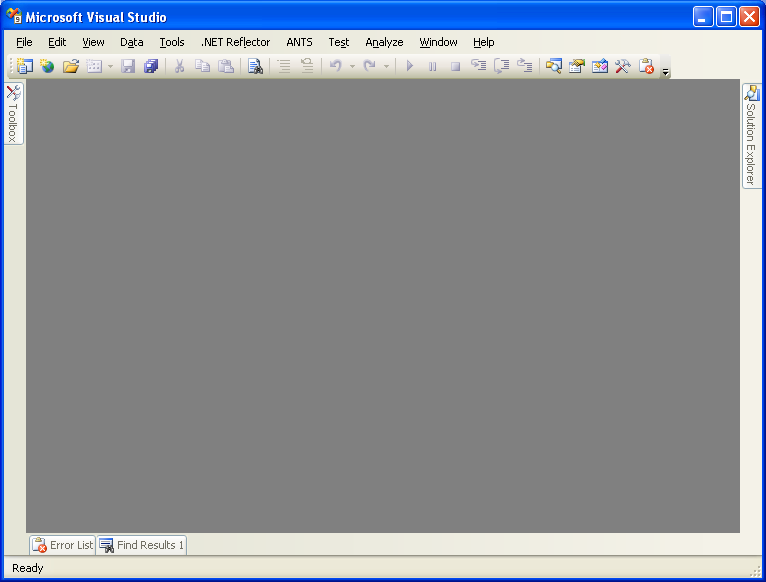 Whenever we install Vistual Studio to our system, then by default, when we open the IDE, following screen is loaded. As we can see, it includes some news section(marked in Red) that gets download via internet and some other stuff, like Recent Projects. Normally, only stuff that we use Recent Projects. Rest suff are some news that gets loaded online. Which normally makes the loding of IDE very slower, and even sometime after clicking on VS icon we have to wait for a while. So we can change this behavior as most of the time, we don’t go through these in our daily life. Normally we used to open the IDE several times in a day during our normal cycle Home – Office – Home. Now check the checkbox “Show all Settings“, if not checked. Then go to Environment->startup and we’ll see the following screen. Now from the first dropdown , we can select the option Show empty enviornment and unselect the Download content every checkbox. Here we have several other options which we can configure based on our requirement, but above one is faster. It may not look very colorful but Now you’ll feel the Visual Studio IDE loading much faster. Which saves your time and make you feel good. 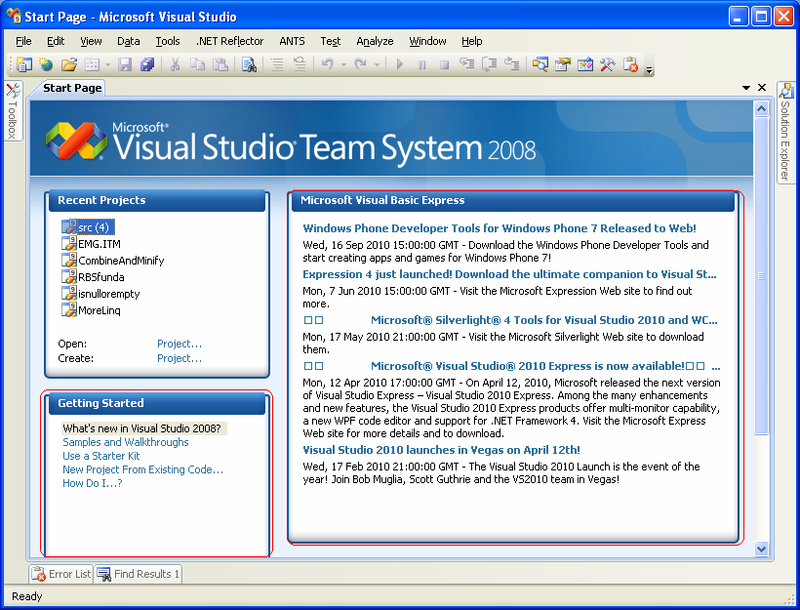 Note: I have Visual Studio 2008 for the blog post purpose, we can do the same with Visual Studio 2005 also. So enjoy your Visual Studio!! !